I have been up for two days now, praying and praying about the same things for eight months. I mean the same prayers over and over again. You would think I’m a crazy bug, I really want God to do something in my life, that can’t do on my own. I don’t live pray. I am Prayer. I pray all day and all night. My daugther always say to me, mom, when are you going to lie down and sleep. I would respond, darling mommie is going to sleep right now. And she will yell from her room yep right, and we both will just start aughing. Don’t ever get tried of praying. Pray is the golden key for healing , comfort in a storm. And peace and joy. I know when I usally pray for hours and days, my breakthrough is coming. We must pray and believe that our prayers will be answer. When I’m going through fear or doubt I read Psalm 91. Sometimes I will read it every day until,it falls in my spirit. I’m far from being like, I have it all together, not true. It is prayer that sustain me. Prayer heals you everywhere you hurt. I want To do great things for the people and the ministry. Always remember, if you don’t have any thing else. You have prayer. Use it, with a clean heart. And God will do great things for you. 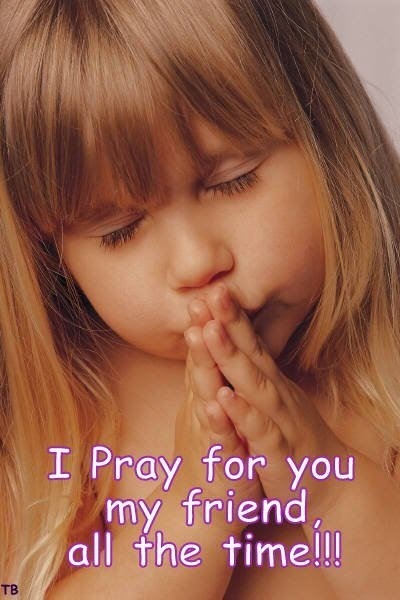 Be Bless I’m praying for you. To all my blog readers, HOPE EVERYONE ENJOYED THE PARADES OVER THE WEEKEND. I was ten years old, when I got Saved. But has I got older,I left the church for a great many years in my life. I came back at the age of thirty eight. How I remember that, I was breast feeding my baby at the time. Church service was so long at my brothers church, My breast use to fill up with milk and pain me so bad, cuz it was getting near to go home and feed the baby. O, by the way, it was a bottle there in case I didn’t make it Lol. I got saved In a baptist church, at young tender age. But it was the pentacostal church were I encounter the presence of God. Sometimes church could go four hours top and some, In the pentacostal church. It’s funny now when I look back on some things. I where jeans to church now. I would never but on a pair jeans for church, the women said, it was a sin to wear pants to church. And you better not show up without stocking on your legs, and sandals on your feet. Wow! My dress had better be five inches pass my knee. I raise my kids the same way that the church raise me. My kids couldn’t where jeans at all on Sunday for church. And they had to wear stocking at very young age also. I believe in my heart, if you are cover up and look nice and lady like. I don’t see what the problem is. I started letting my girls wear jeans, and guess what, they still love JESUS. It’s a holiday, I wear my swimsuit, I’m not going to any cookout at the beach with a Long dress on and pants. Yes I love God. But if you want to put on a swimsuit for the beach, then do it. It does not make you unlady like. You must not worry about what people think. Go and have fun. I wear my swimsuit. I feel so good and pretty. Be free let yourself shine with happiness and joy! This is all for the CHURCH FOLK! I have been crying today, not because I’m weak, I cry because I care. I’m always concern about others SOULS. I cry because, I want God to know that what ever I’m asking Him to do, he hears it in my cry. I cry when I pray, because I love Jesus so much. We must stand on the word of God even when the enemy attacks. Yes it’s hurts when you are nice, and people still treat you like a door mat. You must bite your tongue. Words Hurt. People think because you love God so much, you a weak person. Calling on God is very important. Share your feelings with Christ. Prayer always makes me feel better . I surrender my all to God. It’s Friday, and you are looking at the clock , and saying, I can’t wait to get out of here. What a week, O these people have gotten on my last nerve! Even when you leave your job, there is always going to be something in life that get under your skin. Rather it be at your job, at home, or the highway stuck in traffic. It’s always something that make you want to say Lord why me? Life is not a bed roses. Life is a bed of thorns. We have to lick our wounds everyday until healing comes. When you leave your Job don’t leave angry, because if you do, you will go back angry. When sitting at your desk. Breath deep, and pray to The Lord, and ask Him to get you through your day. It is not your job you hate it is the people you work with you have a problem with. People are going to be just who they are. You pray and ask God to help you be the bigger person in that situation. Take the weekend, and make yourself feel great. NO! I don’t mean shopping. Look into your heart and search for the very thing you been wanting to do. AND DO IT! Don’t feel guilty cause you want to take time with you. I pray that we come to know, that life is what you make it. That’s means make plans for your weekend. Don’t spend your weekend on the phone talking about the girl over at the next desk. Get out of the clicks. Make God your your friend, he’s the best. You can tell Him anything, and you dont have to worry about Him spreading it through out the work place. Don’t expect anything from anyone, people can’t help you. They just want to know your business. The work place and church is the hardness place to fine true friends. I don’t look for friends anymore. God is all I need for any problem. You know, how I know this. After so many disappointments from friends, and lets not leave Out family. I became very drain trying to love people that didn’t love me. So I love them, but I don’t attach myself to them. Meaning. Be nice, love everyone, don’t get caught in the day, listening to things are just dirt and waste. Make yourself available for God. You will have more PEACE and JOY! I’m so over joyed, thinking on the goodness of The Lord. God is my daddy, I can go to Him and ask for anything and he will supply all my needs. Every time the barrel gets low God comes in and blesses me. I have been on this journey a long time asking God to open doors, that know man can close. The Bibles says have faith as small as a mustard seed. God is so faithful every time I think of His goodness, my eyes swells up with tears. The Teacup Ministry as just been birth. It has went to levels , I know that God did it. God will never let you down, if you trust in His word. You can accomplish any goal you want. By trusting in The Lord with all your heart. GOD IS FAITHFUL. HE KEEPS HIS WORD. AND HE NEVER CHANGES. Father God I love you so much. When you tell me, that you are going to do something In my life .Help me not to doubt you. Jesus I thank you for blessing me even in my doubt. You are so awesome. thank you for blessing me over and over again.